Ed and I sat in stunned silence. There was a dank, black empty feeling oozing down over me. Cold and distant, yet agonizingly painful. The words spewing from the smoke of the fat man’s cigar were going astray, some hitting, some missing. I was drifting in and out. Had all of this been for nothing? The question was directed at God. With attitude I’m afraid. The years of preparation? The experience? The planning? The dreams? Learn how the original Benji movie was made and distributed without any help from Hollywood. And how a successful film career morphed into the National Bestselling book The Soul of a Horse – Life Lessons from the Herd, changing the lives of thousands of horses – and people – for the better. All from Joe’s perspective today, looking back to understand how every devastation that he believed to be surely the end of life as he knew it had to happen exactly as God orchestrated it or there never would’ve been a Benji. Or six Benji films. And there never would’ve been best selling books changing the lives of horses all across the planet. Or a second love of his life after his Carolyn was called home. 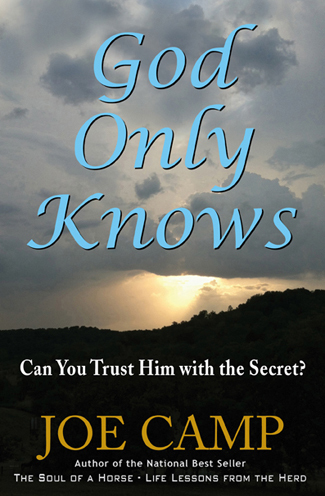 God Only Knows is like reading a novel, emotionally involving and full of conflict while ever shredding away the camouflage of our resistance to fully trusting God so that we might banish the worries and concerns and climb out of the devastation because we know He is there, front and center, giving us the actual evidence. Evidence that we can see and feel and touch. “I LOVED GOD ONLY KNOWS! Joe writes extremely well. The words flow so beautifully that it feels like I’m having a conversation with him. The feelings he brings out are wonderful…uplifting and sometimes sad. I think anyone who saw the Benji movies will want to own this book. The movies move so flawlessly from scene to scene that no one would ever know how much work was involved just to get that one shot and also all the work going from city to city to promote it. Towards the end of the book when he’s looking for a distributor I got so pumped! Why? Because when the ‘big wigs’ wouldn’t take on the film he never ever let anyone tell him he couldn’t do it. He soldiered on (and we are all glad and grateful that he did! ) For who benefits more than Joe from these movies? WE DO! And the good feeling from them radiates throughout the entire world. Thank God for such perseverance and tenacity. He knew within his soul that this could work… no ‘if, ands or buts’. That in itself is one of the greatest lessons of all… never give up! It’s too easy to lay down and die…..why not fight for what you believe in and help change the world?